Now, I’m not a typical palette addict. To this day I do not own one single Urban Decay eyeshadow palette. For me to buy something bigger than a quint is noteworthy and I must see some really interesting colors in a big palette to want it. Like this: Smashbox Double Exposure. I was drawn to the fact that it has cool and warm shades, purples and peaches. The rest is just a bonus, really. If you click on the pic you should be able to read the names of the shades, if you want to. Shamshbox claims these shadows can be used wet and dry and the pic lists the ways that using wet changes the shadow. More on that later. Click the pic to enlarge. Now, usually I am able to offer more than one swatch pic for such a number of shadows, but somehow all my pics turned out unusable. Boo. Also, the light is more to the yellow side in this pic, which might make the warm shades look even warmer. I swatched top-bottom repeat, so the first two shades on my wrist are Silver and Midnight. Silver is a cool shimmery silver. Midnight looked blue in the pan, but swatches more like a black base with blue shimmer. Next are Mauve and Temper: Mauve is the shade I used most so far, it is a shimmery lilac and goes with everything. Temper is almost matte and applies darker than it looks in the pan. Like, quite a bit darker. I was like, oh this is a good crease color and applied it liberally in my crease but it’s dark and well pigmented so I spent quite a bit blending that out again, haha. Next two are Peony and Haze: Peony is a shimmery pale pink and great on the lid. Haze is a shimmery cold lilac, it has more grey than Mauve and makes a good crease color (also a good color for using as single tone all over). Next are the two that cut the palette in half: Blanc and Noir are the colors in between the cool and the warm shades. The names are pretty self-explanatory. Blanc is the color with the least pigment in the palette and the highest grade of shimmer. It’s the color you use to place down highlights. Noir is a soft matte black. Quartz and Copper: Quartz is an oh so pretty coral shade with gold touch, similar to MAC’s Rubenesque. The color has a high amount of shimmer, and note that this color is not coral with gold shimmer! Both colors, coral and gold, are the shimmer, there’s a slight duochrome quality to it. Quartz is a burgundy brown color with shimmer. It is also quite dark and pigmented and should be applied with a light hand. Flushed and Fig are next: Flushed is a shimmery peachy bronze color, the shimmer is more on the silvery side, but overall this is still a warm color. Fig is matte, and again darker than it looks in the pan. I use this for eyeliner a lot. A great autumnal color. And the last two colors are universally useful: Veiled and Espresso. Veiled is a matte vanilla and can be used with pretty much all looks to blend colors out. It could also be used all over the lid to neutralize it. Espresso is matte, too. For once, this doesn’t apply darker than in the pan. All colors are well pigmented. the shimmery colors are smoother than the mattes, but with the right brushes the matte apply well, too. The shimmery ones are too shimmery for my taste, I usually apply shimmery lid colors over the Urban Decay Primer Potion in Sin, but with these I used the Primer Potion in Original instead. Original usually swallows too much of the shimmer, but the Smashbox shadows were still super shimmery. Apart from that, the mix of shimmery and matte colors is good, but I would have preferred Temper and Copper to be less shimmery. Lasting power is good, all day with primer, and five hours without. The wet and dry thing, now… They claim you can use the shadows wet and the pan will be jst like before. I was sceptical and used only a little corner with a wet brush and just like I expected, the wet part changed. You can tell exactly which parts of the pan had been wet. Now, the shadow itself is still good to use, but I very much would not advice to slap a wet brush all over the pan. Also, since they are so pigmented anyway, you don’t really need to use them wet. I only use them wet for eyeliner, and usually not even then. And most of the shadows are supposed to get more metallic or sparkly when wet. I say these are already shimmery enough. This is a very good palette, very good mix of pretty colors. Don’t bother using them wet, they are good enough dry. This palette is for the lovers of shimmer and shine, even though there are matte colors, too. This is the Smashbox Limitless 15 Hour Wear Cream Shadow in Stone. To be honest I don’t pay much attention to Smashbox, because I’m always distracted by other shinies, but they have some real good stuff. My review for the palette I showed in my haul will come up as soon as I have the time to type it up but as a spoiler: I love it! Alright, back to this single shadow: From the name I expected something grey and it certainly looks grey sometimes, but it’s really more of an olive, muddy color. Which I love, I think such greenish muddy colors always look amazing on the lids. The texture of this cream shadow is gel-like, very similar to the Maybelline ones. It can be easily applied with fingers or a brush. Swatch. You can see it leans more brown than grey and it’s sort of khaki, but not really green. I think this is a super useful color, it goes with pretty much anything. It can be used as a crease color or alone. On its own it makes a quick and dirty look, perfect for the mornings when you’re running out of time (always) but still want color on the lids. Wear time is very good, although I wouldn’t go as far as saying it lasts 15 hours on its own. I didn’t notice much nasty creasing, which is good. Cream shadows with this texture usually crease lots on me. I’d still recommend using a primer, but it’s okay on its own. With primer I get an all day wear out of it. So, the story is as such: I had put money aside to splurge on the Chanel Fall Collection because it looked so good and I wanted a number of pieces. Then August came and the Collection didn’t. And then September and still nothing. Finally I asked and got the info that Chanel wants to release everything here later from now on ‘because the customers want it’. Apparently people don’t want to buy Fall Collections in August. The collection won’t release until October – when all other brands already have their Holiday Collections out. And lastly, Kiko currently has two really cool LE out: Midnight Siren and Rebel Romantic. I picked up the Cream Radiance Highlighter and a Moon Shadow from Midnight Siren and a Contouring Pencil Set, Liquid Intense eyeliner and a Color Definition kajal (that one was a freebie) from the Rebel Romantic Collection. Do you have any recent purchases? Which Fall Collection do you dig? Lazy sundays are good days to clean brushes. They can dry overnight and are ready to use on monday morning. Currently I am using the Bobbi Brown Conditioning Brush Cleanser, which yes, it’s very expensive, but I need so little it’ll last for years. Brushes, Pt 1. They are still wet, so they look a little worse than they are. I have folded my beloved strawberry towel, so that the handles are higher than the brush heads and the water can drop down. The brushes are from left to right: MAC 213, a good one to apply shadow on the lid, Look by Bipa Eye Blender, this one is a favorite of mine! Bipa is an Austrian drug store chain, their own brand Look by Bipa is cheap and comes in the store’s signature colors white and magenta. The other brushes aren’t so great imo but the blender brush is amazing. It has the same shape as the MAC 217, but with synthetic hair. It blends just as well as the 217, you can only tell that it is much cheaper when you use and wash it very often. 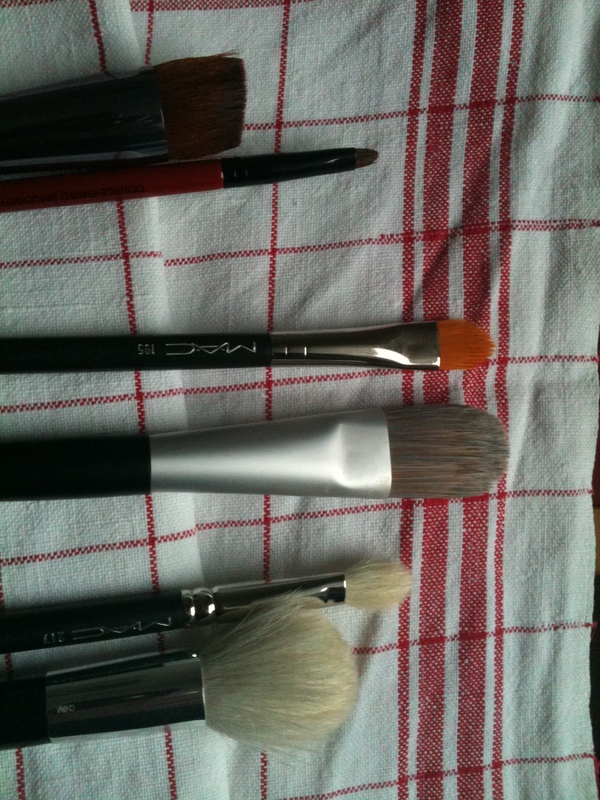 The angled brush in the middle is MAC 266, a favorite of mine to apply eyeshadow as liner. The MAC 195, a concealer brush. The black one is an eyeshadow brush by ebelin. I don’t really like it; it’s what I use when I run out of clean brushes. Brushes, Pt 2. On the very left the Bobbi Brown face blender, an absolute staple of mine. I use it for all over, blush and bronzer. Then MAC 219, a pencil brush. Next an absolute favorite, MAC 214! I use it to apply eyeshadow on the lower lid. Sadly, it does not seem to be in the regular range, only limited edition??? Next to it, another Look by Bipa eye blender, then my favorite liner brush, the one that comes with the Maybelline gel liner. Then an angled no name brush that I use for brows. MAC 217, I don’t think I need to tell you about it. Then smashbox smudge brush which I use when the 214 is not clean or to smudge liner on the upper lid, although it’s a bit scratchy. The big white one is a MAC 129, my second favorite blush/bronzer/whatever brush, then another 217, the Shiseido foundation brush, and last brush is the 213 again (idetical to the one in the pic above). Now, this post is not a list of my favorite brushes ever (on that list you’d find the MAC 188, for example), but simply the brushes that needed cleansing and were drying on the towel when I had the idea to snap pics. But it’s a good show of brushes I use often. I have four eye blender brushes because I use them a lot. I’m tempted to get another one of the Bipa brushes, but it’s often sold out. Most of my expensive brushes come from Holiday sets, that’s why the colors don’t always match up to the regular ones and the handles are short. I like brush sets, you get more for less money. But I only buy them when I know I can use the majority of them. Wow I didn’t even realize I used this many brushes lately. MAC 130: This is kind of a face allrounder. I don’t even know what they sell it as, imho it can be used for liquid, cream and powder products, for foundation, bronzer, shading, blush, highlight,… it does pretty much everything except for lips and eyes. It also does not cook breakfast. Boo. MAC 188: The longer and softer version of 130, my most used brush for blusher, be it powder, cream or liquid. MAC 195: Yeah, this kind of a MAC fest in here. I use this brush to conceal bigger areas. Smashbox double ended smudger brush: One day I decided that I needed a smudge brush right now and this was the only one available/the first I found that day. It was also on sale so I didn’t look any further. Ebelin eye shadow brush: Ebelin is a cheap brand available at DM. This is a good if a bit small brush for eye shadow. Bobbi Brown eye shadow brush: This came in a set, it’s also double ended, the other side is called “liner” but I’m not completely sure if it is for eyes or lips or what. The eye shadow side is meh, mostly usable for the crease. I only use it when there is no other clean brush around. Alicia eye liner brush: I use it for concealing. It’s perfect for concealing smaller and slightly bigger blemishes. For the longest time I used concealer brushes that were too big; this makes one hell of a difference! MAC 217: Do I even need to describe it? It’s the perfect eye shadow brush. I also use it for blending (in case I applied the shadow with a different brush) and highlighter. This is the most perfect eye shadow brush and I think I’ll buy some more. Alicia eye shadow brush: Sorry I don’t know exactly what it’s called like. It’s a flat slanted brush. I use it to apply eye shadow as a line. It’s okay, but not perfect. And last, but not least: Bobbi Brown face blender: The ultimate face brush for powder products. I use it for all over, bronzer or blusher. Now this is pretty much my whole brush collection. Not pictured, but also pretty good (and possibly included in my last brush post?) are my no-name foundation brush – I forgot where I bought it, my Shiseido foundation brush (love at first feel) and the Bobbi Brown eye blender. The eye blender is not used for application of eye make up, only to brush over it and beat it into submission. It is magic. Like the title says, sunday is my brush cleaning day. 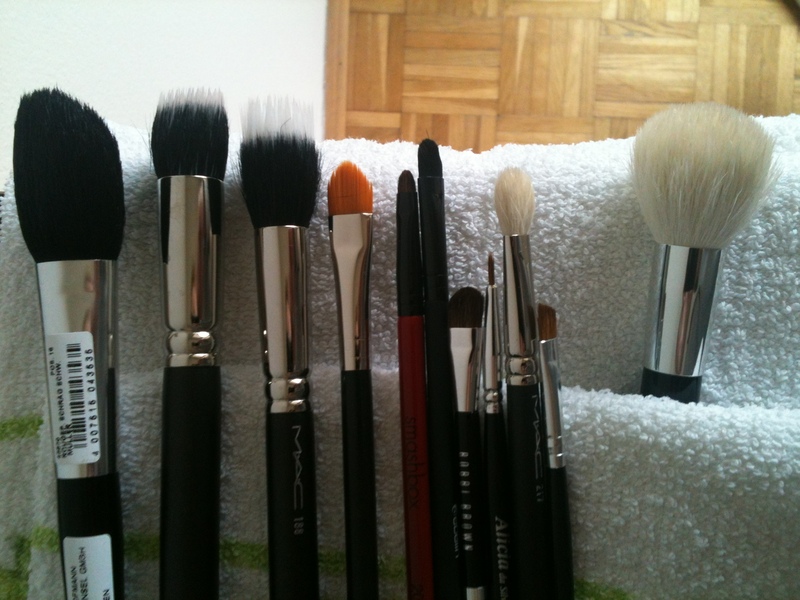 I didn’t use many lately so this pic showing the drying brushes also shows my go-to brushes, those I use the most. I clean them by putting a tiny amount of shampoo on my hand, swirling the bristles in it until they come off clean, then I rinse them and put them on a towel with a downward slope so the water drips down and doesn’t damage the brush.